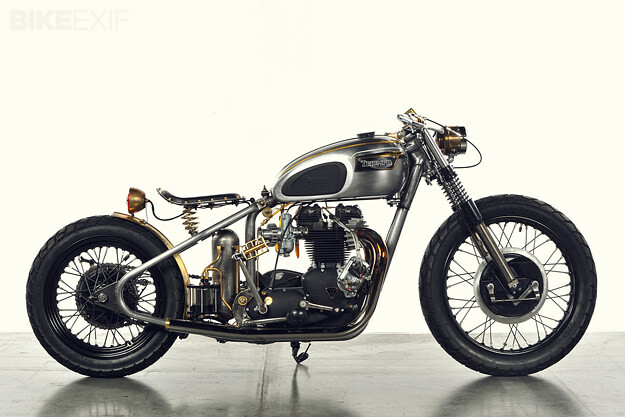 It’s always interesting to see the bikes that well-known builders create for themselves. 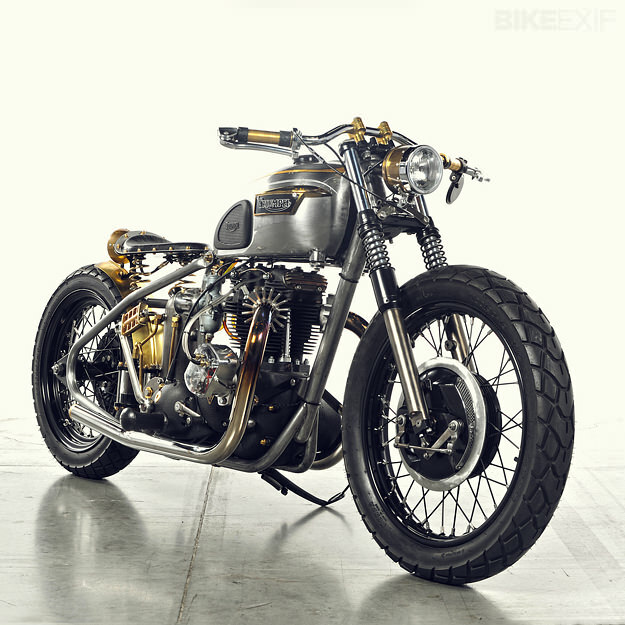 This Triumph T120 Bonneville is the personal ride of Tony Prust; it’s a more ‘traditional’ look than many Analog motorcycles, with a side order of steampunk too. “El Matador” was a labor of love for Prust for two years. 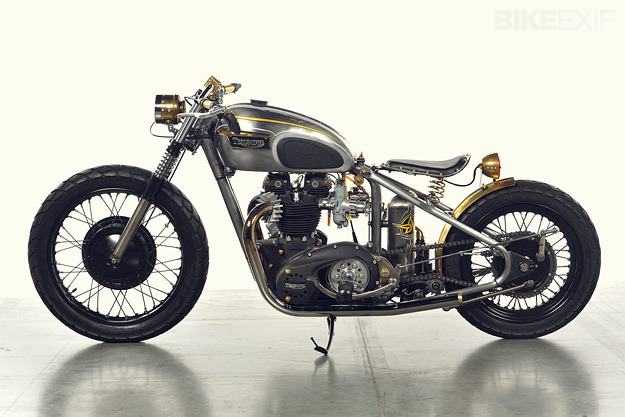 It’s an elegant bike, finished in clear-coated raw metal with brass highlights. 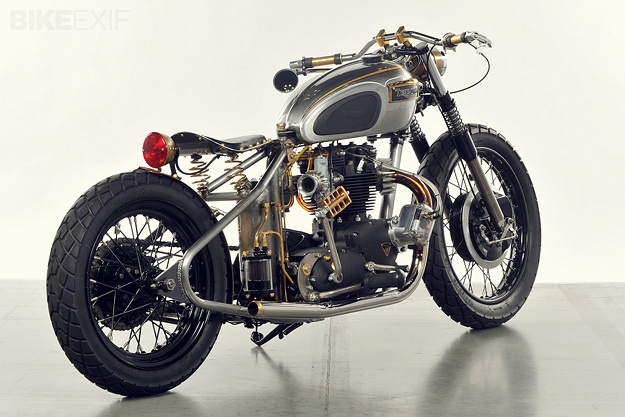 The frame came from a 1968 Triumph, and is now fitted with a bolt-on hardtail from Dave Byrd. The 650 motor is a 1972 spec, and was rebuilt by Ed Zender of the Triumph specialists Morrie’s Place. It’s now powdercoated in wrinkle black. Maund velocity stacks feed the engine, and the pipes are from Lowbrow Customs. The belt drive primary comes from Bob Newby Racing; the open cover was designed by Prust and Zander. Up front, Prust has fitted the forks from a late 60s BSA. They’re hooked up to a twin leading shoe hub laced to 19″ rim, while the conical hub at the back is laced to a 16” Harley-Davidson rim. The tires are grippy dual-sport Kenda K761s, contrasting with the traditional nature of the rest of the build. Prust gave the T120 a full rewire, and installed a Joe Hunt Magneto. (A neat touch is the vintage-style cloth wrapping on the wiring.) 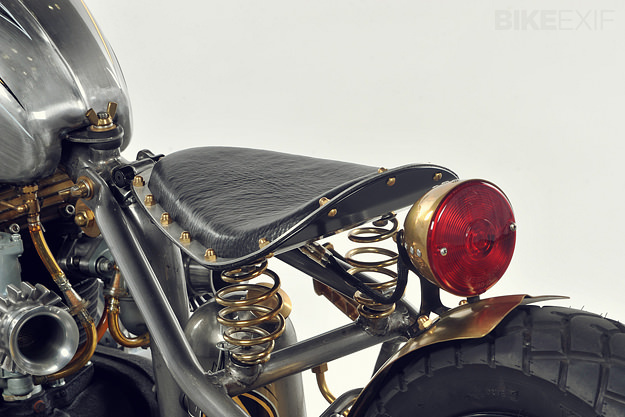 Hand-made parts include the front and rear lights and the solid brass rear fender, which was fabricated by 7 Metal West. 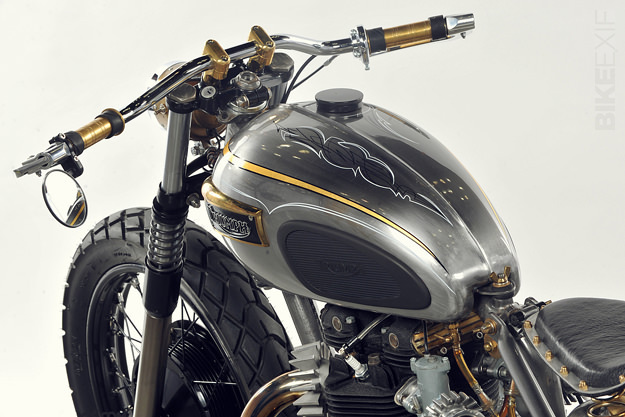 The oil plumbing is solid brass too, along with the tank badges and handgrips. The immaculate clear coat (with gold leaf and pinstriping) was applied by Brando Custom Paint. It’s a little bit gothic and a little bit steampunk, and a showcase for Prust’s old-school fabrication skills. One of the classiest T120s we’ve seen for a long time. Check out our Archives for previous Analog builds, and the Analog Facebook page for news. Images by bikerpros.com.